Peter Mayle’s Provence, well, you can take the book out of the countryside but you can bring it back too. I haven’t read a Peter Mayle book for quite a while. It only took 25 pages into the book to remember what an entertaining writer he is. So, I took him back to Provence. 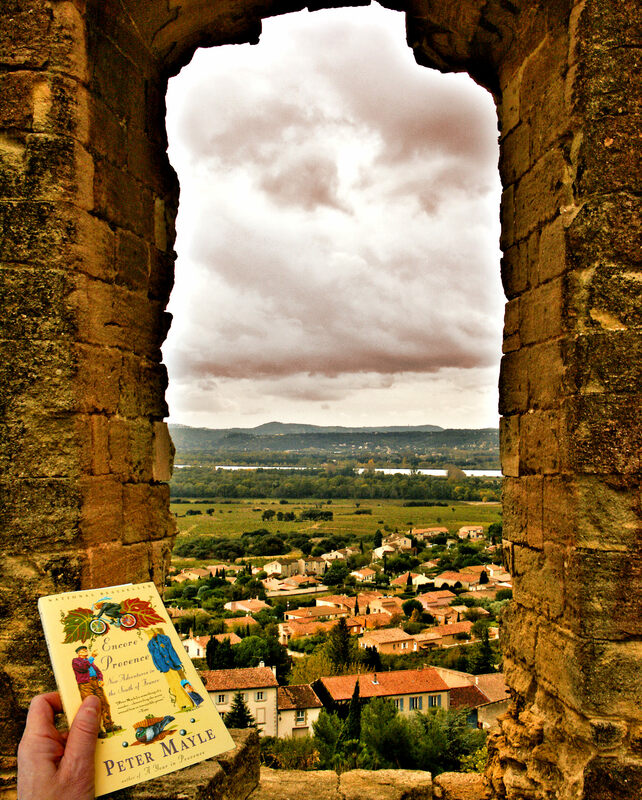 Here he’s at the Château des Papes in Chateauneuf du Pape overlooking the Provence countryside and the Rhone river. Chateauneuf du Pape is one of my favourite places in Provence and not just because of the wine. Within the first part of Peter Mayle’s book, he mentiones the Chateauneuf du Pape market. I did not experience the market; he mentions in the book (the book is a few years old) that it is a Friday market. While I’m sure the market is wonderful, most small French town markets are, Chateauneuf du Pape has much to offer such as these views from the historic ruins of Château des Papes. While I was enjoying the center of town, I couldn’t help but think about the wine festival I had heard about. Apparently, during this festival in early August, a fountain spouts out free wine. Next trip, early August. Chateauneuf du Pape or the Pope’s new castle is near Avignon, the location of the Palais des Papes, the Pope’s Palace. I had just finished a more intense read, James Rollins’ ‘Map of Bones.’ ‘Map of Bones’ is historical fiction that largely centers around the 13th century Pope’s residence in Avignon. It seemed a natural fit for me to go with an easier, well written and much less intense Peter Mayle book centering around the same area. I had already read ‘A Year in Provence,’ the first Peter Mayle book in the series. I am anticipating enjoying the remainder of this one as well as the next.